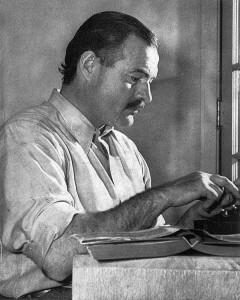 Many regard Hemingway as the greatest American novelist and short story writer of the 20th century. He was celebrated as much for his lean writing style—in which there seemed not a single superfluous word —as for his compelling treatment of themes of masculine identity, morality, and courage. A member of what Gertrude Stein called the “lost generation” of post-World War I writers and artists, Hemingway created fictional heroes in search of meaning in a morally and spiritually shattered world. In the process, he carved out for himself the life of a celebrity author, whose very public thirst for high-risk adventure was unquenchable. He was awarded the Nobel Prize for Literature in 1954.